for a private client who has generously allowed the process to be shared. Today I began the excavation (disassembly) of the Cosy. 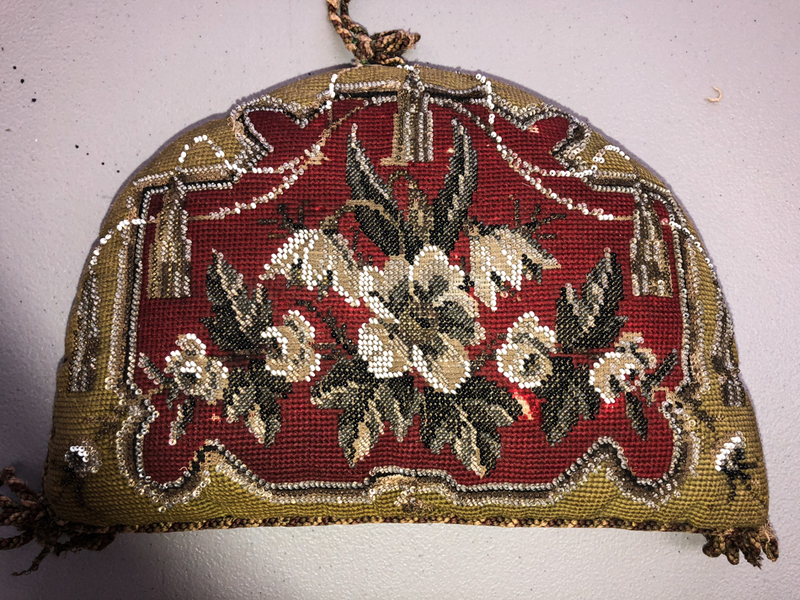 brittle linen gridwork, missing needlepoint… and it is beaded on both sides! Above are details of both sides “A” and “B”. and flashes change the color tremendously. we see the bright green the Cosy once exhibited! to navigate without damaging the beaded areas. and traveled deep into the needlepoint field. Something to think about if you have to create a temporary repair: Hold it loosely! Once the trim is removed, the Cosy disassembly begins. 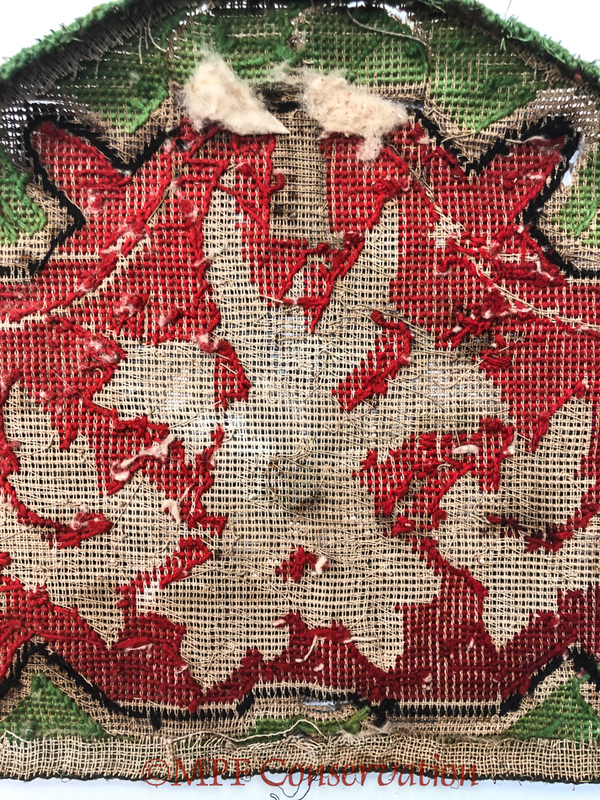 Again, there are areas which were hand-repaired and these stitches are carefully cut. however, it is best not to ever assume and pull, hoping to save time. or a strong stitch that holds and you rip the textile. Patience is key. Side B is top, and Side A bottom. We also see the inside of the Cosy! it once topped hot teas, and the steam embedded dirt on the inside. We are replacing the inside. The textile is removed from the lining! areas are already ripped, and we don’t know the condition of the small hem. I prefer a stitch-picker to any other cutting device. the one stitch I see on the tip of the blade by sliding it back. And we get our first look at the back of side “A” textile. on the back are actually areas where beading was beginning to melt! enough of the piece is apart… This is guesswork, but educated guesswork. Kate takes notes throughout as reminders. of the Cosy prior to final stitching of the entire piece altogether. it lay just below the faded green thread. 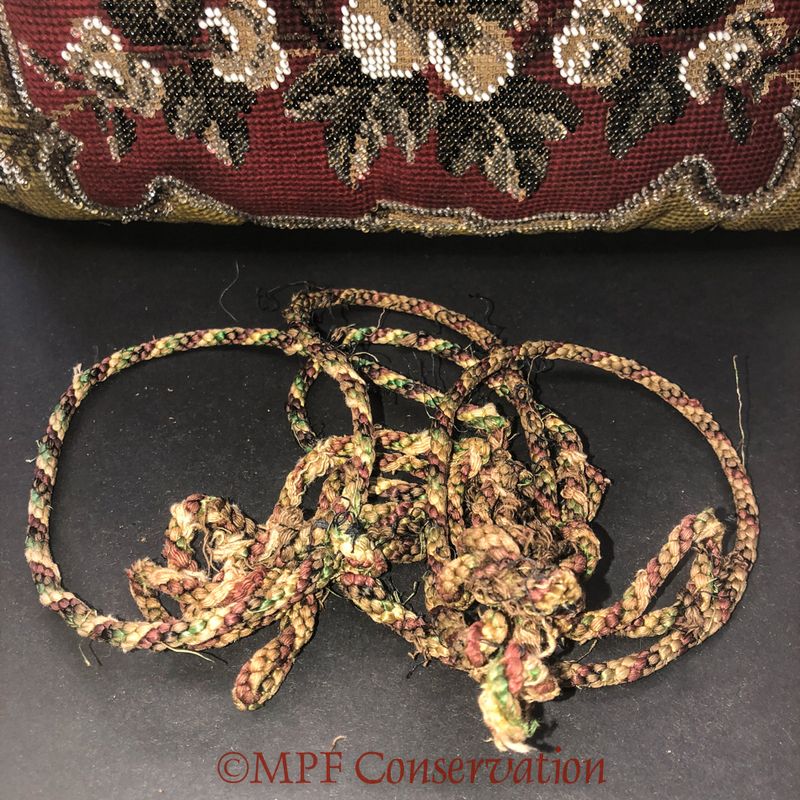 A faded green thread hand-stitched the textile to the lining… it appears a khaki color, but up close you can see that it may have matched the original brilliant green yarn! Finally, the repairs were created using a thicker tan thread, and appear sporadically. Kate began to lift the lining from the textile, and ran into a snag. Beads which melted (first image) had also adhered to the cotton batting. 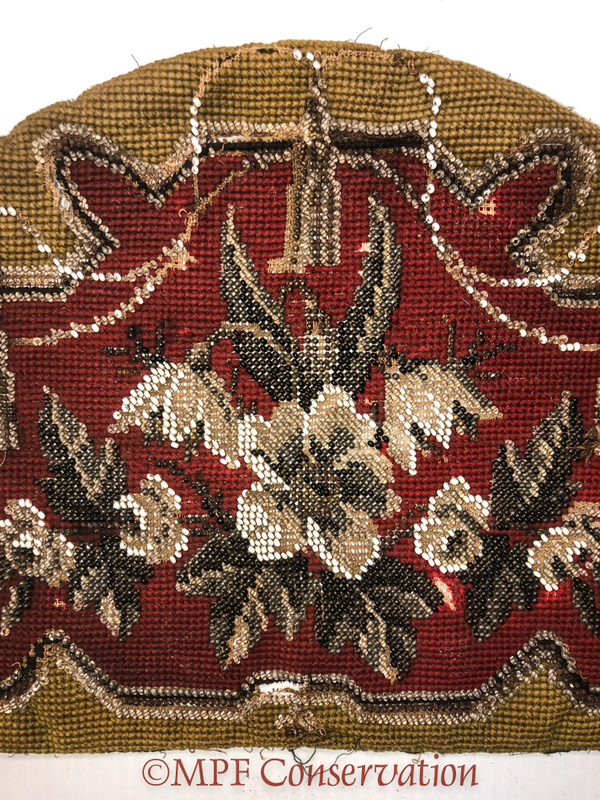 we will discuss melting beadwork in another post. Side “A” is disassembled, above. 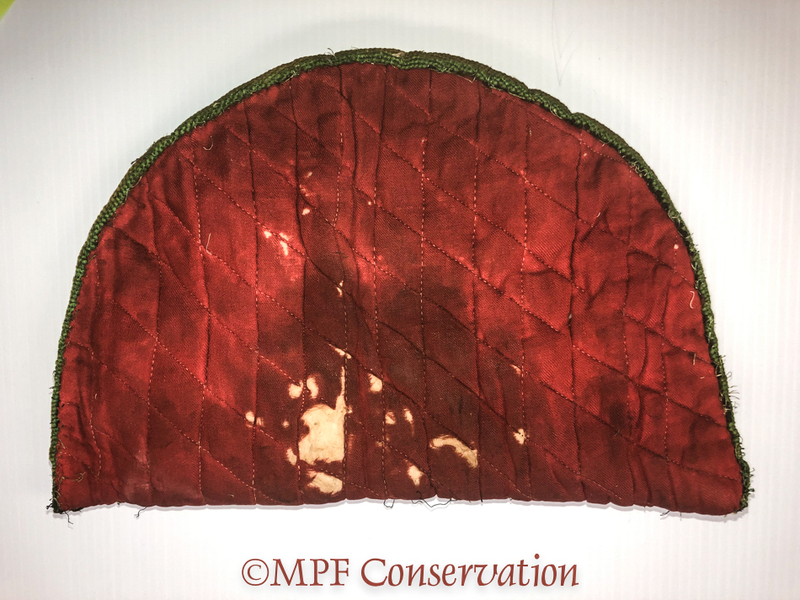 including the cotton batting melted into the textile, and two areas where the previous repairs went too far and tapped into the gridwork. None of the rips are a surprise, however. are secured. In just this round of gentle handling six beads dropped. you can follow along by requesting updates! 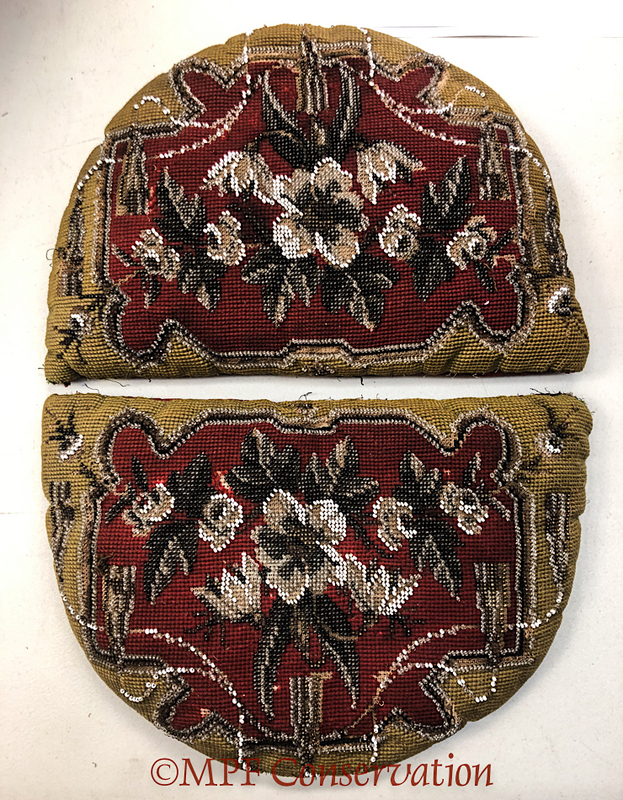 This entry was posted in antiques, art, conservation techniques, decorative motifs, Interim Report, preservation, process, reparation, restoration techniques, textiles and tagged #beadedneedlepoint, #beadwork, #mpfconservation, #needlepointrepair, #pacificnorthwest, #portlandoregon, #teacosy, #tentstitch, #textileconservation, #textilerestoration, #victorianbeadwork, #victorianteacosy, bead repair, bead work, conservation, needlepoint, needlepoint repair, preservation, tent stitch, Textile conservation, Victorian, woven beadwork, woven beadwork repair. Bookmark the permalink.